Legendary Super Saiyan requires one to have consciousness while maintaining the form. What we have seen so far (canon and non-canon) was the berserk state, where the user is simply out of control. As we know in order to attain Super Saiyan 4 one needs to have consciousness during the Golden Great Ape state. The Great Ape forms have been known for all Saiyans to be a berserk state that can only be triggered when specific conditions have been met. The user is "rewarded" with tremendous power, but no control. This all is extremely similar to Legendary Super Saiyan Berserk. Once the user gets consciousness in the state he/she can then evolve into the next stage, which would be Super Saiyan 4 (for Golden Great Ape) or Legendary Super Saiyan (for Legendary Super Saiyan Berserk). Since both forms (LSSJ and SSJ4) require the same amount of consciousness and mental fortitude, does this mean that they are basically the same? I found it extremely difficult to find some actual information on the progress of the two being unlocked so therefor this conclusion is purely theoretical. Assuming they are, all Saiyans are able to become a Super Saiyan 4 with enough training, consciousness etc. Are all Saiyans also able to become a Legendary Super Saiyan or is it purely genetic? From what I've seen so far, the only distinctive features it has, is emitting enormous amounts of ki. We have seen that Saiyans were leaking ki all over the place, so in that sense it should be possible for all Saiyans eventually, or am I completely wrong? Sources: mainly dragonball wikia, Reddit, the series from which DBGT for knowledge about SSJ4, DBZ+DBS for knowledge about LSSJ and DBS for Whis explaining loads of things. Firstly, there is no explicit reference in the Canon - Series to Broly's form being referred to as the Legendary Super Saiyan. Broly's transformation is referred to as Full Power Super Saiyan and when Kale uses the similar transformation, Vegeta states that it might be The Saiyan's True Form, which you can see here. With reference to your point stating that we have seen these transforms only in their Berserker state, that would be incorrect. This is because we see Kale control her form during her second fight against SSJG Goku alongside SSJ2 Caulifla. Although I cannot state an explicit reason why a regular Saiyan cannot attain this form as there haven't been any official statement released with regard to this, I suppose I could make a reasonable argument indicating why this transformation is genetic and has not something every Saiyan can attain. If we first look at the way Kale attained the transformation. She had no notion as to what a Super Saiyan was. Her anger out of jealousy resulted in her transforming to this level of power which shocked Caulifla and Cabba. Before she transformed. So it clearly doesn't require greater power as Caulifla was stated that be much stronger than her, it doesn't require any specific training as again, Kale was indicated to be inferior to Caulifla in every single way. The only unique way in her transformation compared to Caulifla's, is that she was angry. However, Goku, Vegeta, Cabba & Future Trunks transformed into the regular Super Saiyan forms out of anger. And clearly, their level of angry was much greater than that of Kales. Hence, based on that precendent, the only reason we can argue why Kale attained the form is because of her genetics. While Broly in his Super Saiyan form had yellow hair, Kale in her "Regular" Super Saiyan form had yellow hair with a tinge of green. The form wasn't indicated to be superior to a regular Super Saiyan and it was even referred to as a normal Super Saiyan( As Champa states he couldn't understand why 2 Super Saiyans were struggling against Goku). Again the only explanation for this points to genetics. Now let us examine the form. Is the form the strongest possible Saiyan transformation? No. While Broly was strong, it wasn't the form that made him strong. He was holding his own against SSJB Goku in his wrath form which more or less was like a powered up Base form(With the power of the Great Ape). Hence, the form made him several times stronger. Just like his Super Saiyan was stronger than Super Saiyan Blue Goku. Kale, on the other hand, was much weaker than Broly in her base which is why her iteration of the form was much weaker than SSJB Goku. Continuing with my point above, this establishes the fact that there is no reason from a Plot perspective why Goku or Vegeta should master this transformation. The Super Saiyan God and Super Saiyan Blue transformations are still Superior. Goku and Vegeta's training with Whis have resulted from them in going towards the route of Ki Control(Which involves hiding and suppressing your level of energy), unlike this form which is the complete opposite. Now let us look at fusions. Fusions tends to share the genetic characteristics of both the combined fighters. When Kefla transformed into SSJ1 and SSJ2, she retained the green hair in both those forms, which could only mean one obvious thing. The trait made its way from Kale's genetic makeup. If it was a unique form, it would've been acknowledged as one, however, it wasn't. Finally, Adding on to my first point, the one common trait that Broly and Kale share is that the two of them had absolutely very little knowledge with regard to transformations and the main trigger in case of the two was just anger. We have seen all the Saiyans display anger and reached powered up states like Vegeta did against Beerus, Goku against Goku Black & Zamasu and attain transformations like the SSJ and SSJ2. At the same time, we have also seen Trunks attain a completely new unique transformation which made him stronger than Kale. That indicates the form isn't the peak or the maximum level of a Super Saiyan. It is only a unique level of power with unique aesthetics which only Broly and Kale can use. With reference to the movie, I do understand Vegeta's hair turns Green and Goku's ki turns Green as well. 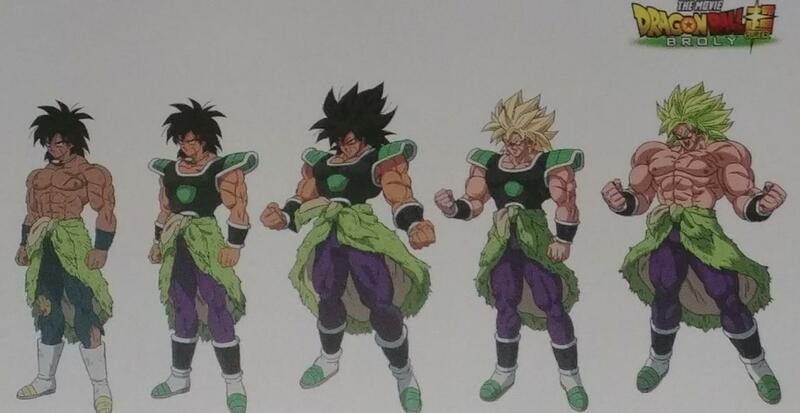 However, I strongly feel this was done to create some form of contrast between the Saiyans and Broly for fans who are new to the franchise and have less knowledge about the transformations. Or, it could be solely an artistic choice. The reason I strongly feel the same is because, the green hair Vegeta displayed was a transition between Super Saiyan and Super Saiyan God. Vegeta has Never displayed that form a single time in the series and to be fair, it wasn't even indicated as an explicit transformation as it seemed more like a transition shot between SSJ and SSJG. Another interesting theory which some people seem to think is that it was a way to indicate to the fans, the different levels of power of the Super Saiyan forms(The Full Power Super Saiyan(LSSJ) form is > than the Super Saiyan while inferior to the Super Saiyan God). Then again, this is just a theory. SSJ4 and LSSJ are basically the same? Are all Saiyans also able to become a Legendary Super Saiyan or is it purely genetic? This is what I personally think. Since the state is "legendary" and since the original super saiyan was also "legendary" in some sense (Vegeta mentioned the regular super saiyan was the legendary super saiyan in the series, later it was retcon into the legendary super saiyan is the green hair type) they only can be achieved by some saiyans. But so far no official or canon answer has been given on the matter. We can only infer the authors intentions through what they showed in the anime, manga and what they say in interviews, twitter, etc.